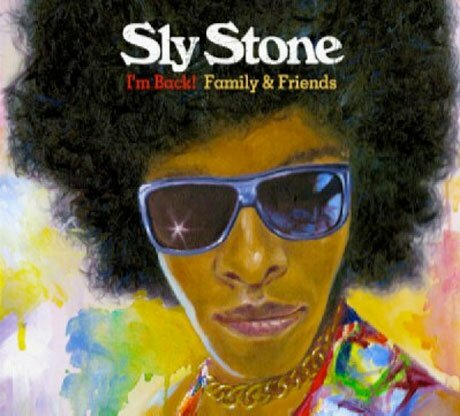 After a nearly 30-year absence, funk and soul icon Sly Stone is finally releasing a new album, and he's bringing his fabled backing band, the Family Stone, with him. A couple years back, Cleopatra Records announced it had inked the soul superstar, but it wasn't until now that the label had the finished product. The album, appropriately titled I'm Back! Family & Friends, drops this August. The album -- Stone's first with the Family Stone since their break-up in the '70s and first overall since his 1982 solo set, Ain't But the One Way -- doesn't feature much new material, per se, but it does include some reworkings from the group and some of Stone's famous friends. Doors organist Ray Manzarek shows up for a redo of "Dance to the Music," while bassist extraordinaire Bootsy Collins pops by on "Hot Fun in the Summertime." You can download the latter here. Other guests include Heart's Ann Wilson, Johnny Winter and Jeff Beck. While you can peep the album's tracklisting below, I'm Back! Family & Friends will also feature three to-be-named club mixes. I'm Back! Family & Friends comes out August 16 on Cleopatra. 8. "Dance To The Music"
10. "His Eye Is On The Sparrow"